Are Above Ground Pools Safe? Posted on October 9, 2018 , in Above Ground Pools. 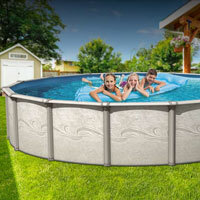 If you are thinking about purchasing an above ground pool, two things may be on your mind. The first could be the obvious fun you will have your with kids, friends, and family during those warm spring and summer days. The next could be, are above ground pools safe? You may be thinking in ground pools can be risky due to kids and pets being able to easily fall in. But what risks do above ground pools present? Above ground pools are safe, but that is as long as you take the appropriate steps in making sure the entire space is well thought out and cared for. Consider these factors when making sure your above ground pool is in a safe space. Like in ground pools, above ground pools should be enclosed in a fenced area. Just because kids or pets cannot fall in, does not mean they cannot be found in the water unprotected. Some above ground pools are surrounded by a deck whereas the pool can actually appear to be in ground. Some above ground pools have ladders that lead up into the pool. Either way, it is still possible for both kids and pets to get into the pool without notifying an adult. A fence can make it more challenging for them to find themselves in the water unwatched. Due to the nature of above ground pools, it is essential these structures have ladders or steps going in and out of the pool. This relates to safety because climbing into the pool can be challenging for some swimmers and they may find themselves falling back onto the floor instead of into the pool. It is dangerous when exiting because some may not be able to pull themselves out of the water and then safely to land on the other side. Children, for example, will be especially susceptible to this and risk being trapped in the water or breaking a bone when exiting. There are plenty of different designs for ladders and steps. Part of this is dependent upon the type of above ground pool you purchase. If you are unsure about your options, be sure to contact your local pool dealer. They will be able to suggest some options for you and your family that will ensure a safe entrance and exit. Some kids are Houdini’s when it comes to unlocking doors and decoding parental codes. This is why there are things like pool alarms. Pool alarms can notify parents and pet owners when there is anyone weighing 18 pounds and up has entered the pool. This can be especially useful for parents who are worried about a curious child. It can be useful for pets as well. Even pets who are well trained can easily slip into an above ground pool. A pool alarm can help a pet who struggles to call for help. Sometimes we need a little reminder that the pool is not deep enough to dive in or that the area around a pool is slippery. This slight signal is enough to sometimes discourage certain behaviors and keep all swimmers safe. Are you considering installing an in ground pool but not sure how safe it is? Above ground pools can be completely safe, as long as the proper steps are taken. To learn more about owning an above ground pool, download a buyer’s guide.